Thank you for responding to my critique of the "Cherokee" content in Mosquitoland. No doubt, many people in children's literature are thinking well of you for what you said, but the conversation cannot end there. With Mim and her "war paint," you--inadvertently--are doing what generations of Native people have fought against for hundreds of years. 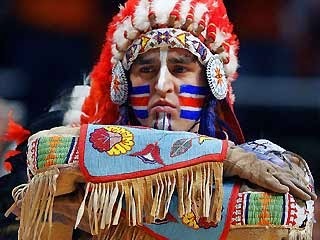 Misrepresentations of Indigenous peoples are of such magnitude that, in 2008, the United Nations issued its Declaration of the Rights of Indigenous Peoples. There are studies of the harm that misrepresentations do to Native and non-Native youth. In 2005, the American Psychological Association issued a statement about stereotyping. Last year, the National Congress of American Indians issued a report on this matter (NCAI's first national campaign took place in 1968). I start with the left cheek, always. This habit is king, and it must be exactly the same, line for line. The first stroke is a two-sided arrow, the point of which touches the bridge of my nose. Then, a broad horizontal line across the forehead. The third stroke is an arrow on my right cheek, mirroring the first one. Next, a thick line down the middle of my face, from the top of my forehead to the bottom of my chin. And lastly, a dot inside both arrows. As you know, Mr. Arnold, people are praising Mosquitoland for its look at mental illness, medications, and Mim's perseverance. Few people (in reviews or on social media), however, are talking about the stereotypical imagery you deployed for Mim's perseverance. That "war paint" gets her "through the day" (as the USA Today reporter said). 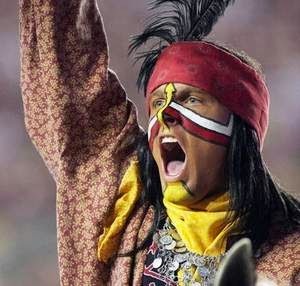 Let's look at some of that "war paint" and how it is used to get fans through a game. Those four individuals--and thousands of others--stood in front of a mirror, just like Mim did, and picked up the items they used for their "war paint" as they got ready to rally their team against a foe. I suspect you had none of this in mind as you wrote those words above, describing how Mim puts on her "war paint" or when you and your fellow author (Jasmine Warga, the woman portraying Mim) worked on the trailer. I watched that trailer on your website. It is gone from there, now. I hope you took it down in response to my review. If that is why you took it down, I think I'm right in saying (above) that I hope you cringed as you read what the USA Today reviewer said about war paint. The question is: what to do now? In my response to your comment, I suggested that you talk with editors and other writers about stereotyping. Looks like you ought to add others to that list, too. I realize this is awkward. How does an author say "this was probably not a good idea" without hurting the sales of your book? I'm well aware that my criticism leads people to buy the book to see what you did for themselves, thereby elevating its sales, which suggests to the industry that people want MORE books like it. We definitely need more books about the mental health of young people, but not ones like Mosquitoland that add to the problems of Native people, who--like those with mental health--are misunderstood and denigrated in far too many places. Given the widespread praise of your book and the fact that you've sold your second book already, I think you actually have a secure platform from which to educate others about the problems in using tribal peoples as you did. You're getting requests for interviews; please use those interviews to educate your readers. I read that there is a possibility for Mosquitoland to become a movie. Please use whatever power you have to keep that stereotyping out of the script. This, Mr. Arnold, is an opportunity to educate others. Since reading your open letter, I’ve taken some time to listen and process. First, I assure you this conversation is not about book sales. In Mosquitoland, I wrote the best book I possibly could, and I am very proud of the outcome; whatever successes or failures I may have, my governing principles are always to be as honest and compassionate as possible. You also suggest that I speak with editors and other writers about stereotyping—know that I’ve been doing just that. This process has led me to have conversations with those in my personal circle (my editor, my agent, my publisher) and other authors in our larger publishing community about a range of characters and backgrounds, discussing how we reach out to those communities we mean to portray in fiction. While I would love to share my own intentions behind Mim’s actions, I do not believe it is the author’s place to discuss intention. Saying “see, what I meant by that…” is a slippery slope, one that robs readers of their own unique interpretations. As I mentioned in my previous response, our interpretations of Mim’s actions are quite different. That said, I think having dialogue is less about agreeing with everyone at the table, and more about a person’s desire to sit at the table to begin with. Mim puts lipstick on her face and calls it war paint. Over the last few weeks, you have made me aware of how those actions might display harmful stereotypes of Native Americans. While that was certainly not my intention, I apologize for the impact it has had in reflecting those, or any, stereotypes. I could not agree more that a healthy portrayal of diverse characters and cultures is important in literature, and moving forward I hope my work contributes positively to that discussion. Again, thank you for replying. Your response is a visible effort to move forward in a way that informs people involved with children's and young adult literature. Right now, I want to focus on your conversations with people in the industry. I am, of course, glad to know you're engaging key people in conversations about stereotyping. It so easily slips into speech and writing! Here's one example. A few weeks ago I started watching The Good Wife. In back-to-back episodes in the first season, I heard two phrases that are commonly used--but--problematic. One is "low man on the totem pole" and the other was "keep him on the reservation" (it is usually "he/she went off the reservation"). My guess is that nobody at that particular table knew those phrases rise from a space of ignorance or oppression of Native peoples. In the conversations you are having, my guess is that some people are encouraging you to ignore this whole thing. Some may be telling you that I (and others who take up the misrepresentation of Native peoples) need to "get a life" or "get over it." Your response tells me that you're not listening to them as much as you are to me, perhaps, but certainly those you trust, who--like you--also want to move forward in a positive way. It is labor intensive work. A few days ago, a librarian wrote to me asking for a reliable source for the Iroquois story of the Three Sisters (corn, beans, squash). I've spent hours searching. I've found a great many sources from the 1800s, but they're by people who were outsiders to Native communities. I've found sources from the 1900s, again by outsiders, who used other outsiders to vet the material. I view all of this as a lot of well-intentioned outsiders. To use the table metaphor, were there no seats at those tables for a Native voice? Are there seats for Native people at that table now? The one you are sitting at? Your response indicates that you are interested in dialogue, so, for you, the answer is yes. Elsewhere, I've written that the seat-at-the-table metaphor doesn't work. Tables are owned by someone. Generally, they are in someone's house. As a guest at that table, there are generally rules that govern how the people at that table will interact. In this particular situation (children/YA lit), the house is major publishers and if we extend it out a bit, review journals. I'm thinking we ought not gather at that table. I'm thinking that it may be best to go for a walk outside where the sunshine and fresh air can help us all move forward as we have the dialogue we both seek. With whatever influence you have, I encourage you to push for more inclusive conversations. In this case, I refer to Native people. I hasten to add two things. One, be mindful of selecting beta readers. Two, remember that it is important that the people you talk with are well-versed in critical analysis. 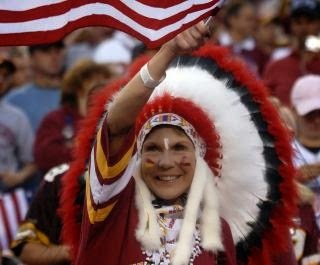 As Dan Snyder (owner of that Washington DC pro football team) has found out, you can find people who say they're Native (and they might be) but who have bought into the "honoring" of Native people regardless of the quality or context of the representation itself. One last thing: did you happen to read my post about Ben Esposito, the educational game developer who wanted to prove that I was wrong in my criticism of his game? Check it out. Kurtis Scaletta ran with the idea I proposed. See his How to Fail. Your willingness to have this conversation with me, coupled with the tremendous interest in the We Need Diverse Books campaign, makes me optimistic.